Not only did I get this adorable note from Caitlin, but there is something about the way they individually wrap everything. Knowing that Caitlin herself walked around the shop and personally packaged my pencils makes me warm and fuzzy inside. For at least a few minutes I had a personal pencil shopper. How much better can pencil buying get?! I plan on doing reviews on all of these products at some point, but I am really itching to try out the Graphite/Highlighter pencil. Stay tuned for that review sometime in the near future! 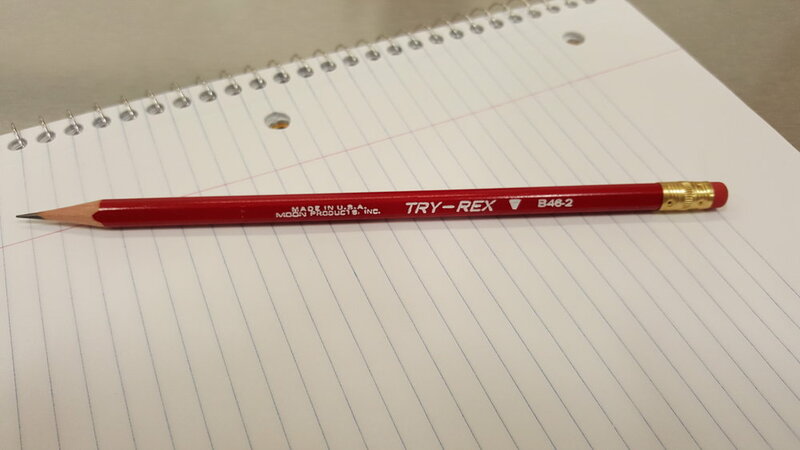 I was particularly excited to try out the TRY-REX since it was "America's first triangular pencil." It is not three-sided like most triangular pencils we are used to, but instead has a unique design that still maintains a hexagonal shape with every other side of the hexagonal barrel being curved instead of straight. This leaves the user with a comfortable grip and a pencil that can be used for long periods of time without hand fatigue. The TRY-REX sharpens well enough, but I am not quite sure of the wood composition as it produces very dusty shavings (even with my Masterpiece) that crumble very easily. It's fairly fragrant, but not a nice deep cedar smell that I love, but instead has a more like an earthy, body odor-like scent (if that makes sense). The graphite hardness/darkness is a tad lighter than I like it to be, but it lays down smoothly and does not smudge that much. Point retention is fair and I am making personal progress with not pressing so damn hard. The eraser is crap-- very dusty and gritty feeling and barely does an adequate job of erasing most marks. I actually prefer to used a seperate eraser anyway, but this is not a deal-breaker for me, but still frustrating nonetheless. They style of the pencil is simple: a bit between glossy and matte red finish with a white imprint. I think it is pretty nifty that they show a little "triangle" diagram on the barrel of the pencil to illustrate the barrel shape. I do not have many complaints about this pencil and at sixty cents a piece from CW Pencil Enterprise, they are worth a pick up. Overall 8/10. When I randomly selected the pencil for this week's review I was admittedly grumpy with my resulting pick. I have a dislike for round barreled pencils. I tend to have a pretty strong grip and I just cannot get comfortable using anything other than a hexagonal or triangular pencil. The Musgrave Bugle itself is quite charming-- it has a nice, deep white imprint of two bugles (duh) and Musgrave's own branding. I usually do not like when there is a lot of information on a pencil, but this works. I love the contrast of white stamping against the glossy wood grain. This pencil has no ferrule or eraser, so it is a bit light, but nothing a pencil cap eraser cannot fix. 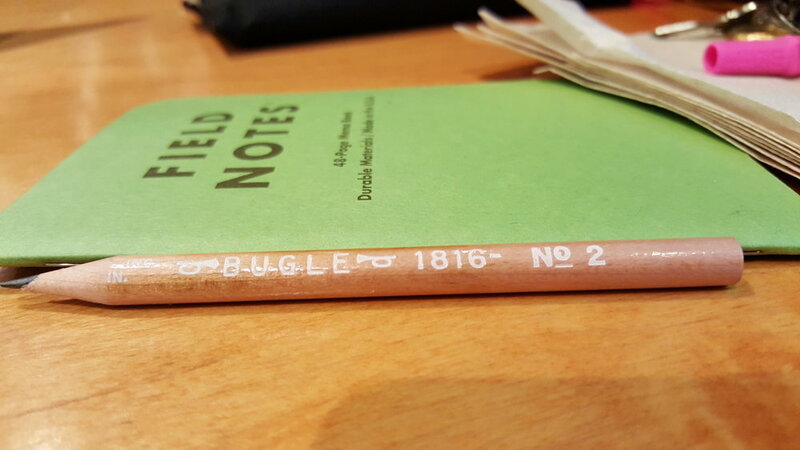 The Bugle sharpens perfectly with no point breakage or crumbling. This is a bonus for me since I spend a lot of time taking notes and do not have time to fuss with crumbly graphite. Point retention is average (I press a bit hard, so this is always a subjective viewpoint). It fares far better than last week's pencil with it comes to smearing and transfer, yet it still has a dark enough lay down of graphite to be acceptable for my needs. From an aesthetics standpoint, I absolutely love the Golden Bear. With two color options-blue barrel; orange eraser or orange barrel; blue eraser- the Golden Bear is perfect for NY Mets or Knicks fans. All kidding aside, for a pencil that is twenty five cents, you cannot beat the quality that Palomino offers. This pencil may not perform like a Blackwing, but you definitely get your money's worth. The lacquer on the barrel is superbly shiny and the barrel itself has just the right amount of edge (somewhere between a Ticonderoga and a Musgrave Testing). The ferrule is gold to match the gold foil stamp and has an orange (or blue) band around the center of it. The cedar smell is fairly strong and the graphite is about standard for a number 2 pencil. Performance wise, the Golden Bear has some high points,but just as many low points. Starting with the positive, the point retention is great for a budget number 2 pencil. It was nice to not have to sharpen as frequently as I am used to. Also, the craftsmanship of the Golden Bear is amazing considering it is so cheap. Palomino really knows how to manufacture quality pencils and it shows. I cannot get over how shiny the lacquer is or how centered the graphite cores are. Well done. Now for the negative. The eraser is horrible as it barely erases its own graphite and leaves a ton of dust. Not really a deal breaker for me since I prefer to use a block eraser anyway, but still. Not good. Another negative was the amount of smear and transfer to opposite pages I got with this pencil. I cannot see myself using this pencil regularly due to the way I like to keep my notes, but for classroom use this pencil would be perfect. Blaisdell Paper Pencil Company was founded in 1898 in Philadelphia, PA, three years after Frederick Blaisdell received a patent for the paper pencil and the machine to make them. Paper pencils, also known as China markers, were wrapped in paper and string. When one would pull the string the paper would curl off and expose more of the pencil (or pretty much crayon). Blaisdell eventually got into the graphite pencil business and produced the well-loved Calculator 600 pencil which was one of John Steinbeck's favorites. The Ben Franklin pencil was their "every day" pencil and were made in mass quantities. The Ben Franklin can be found from time to time on Ebay. I was excited this week to be using a vintage pencil. I have found that vintage pencils have a far superior quality to what is offered nowadays (there are a few exceptions, of course). The Ben Franklin performed beautifully and nailed each and every category I rate my pencils on. The barrel of the pencil was classic yellow with a glossy black imprint. A nice touch was the "2" on the pencil was stamped in a metallic blue. The pencil sharpened up nicely and had a strong, deep smell of cedar. Not once did I experience point breakage and the graphite wore down evenly and smoothly. I really love the ferrule on this pencil-- it is a nice gold with a white stripe around the middle. I want to preface this week's entry by saying that I hate a pencil with a round barrel. I dislike how they roll of the desk when I put them down and I generally do not like the overall absence of those sharp lines of a hexagonal pencil. Because of this strong dislike, it had been years since I willingly picked up a pencil with a round barrel to use for an extended period of time. 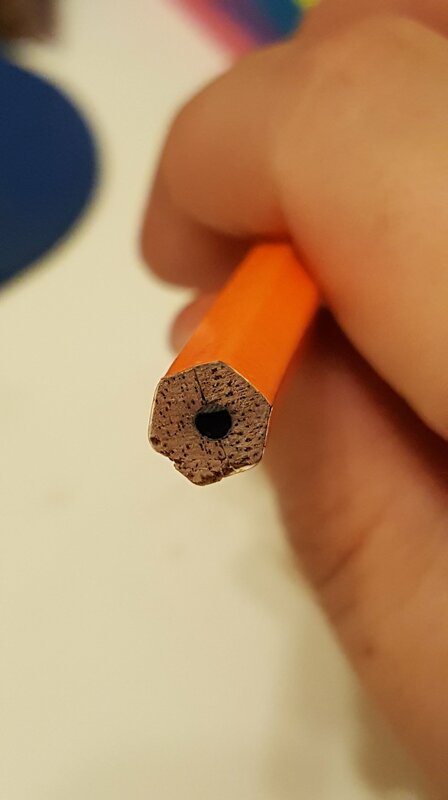 When I did my random selection process at the beginning of the week, my heart sank that I would have to use this round pencil for seven whole days (!?). Would I lose this pencil before then? Would it fall off my desk so many times that the graphite inside would shatter rendering it un-sharpenable? By Saturday, I was pleasantly surprised. After sharpening the Goddess, I immediately noticed the rich smell that wafted up from the pile of shavings. 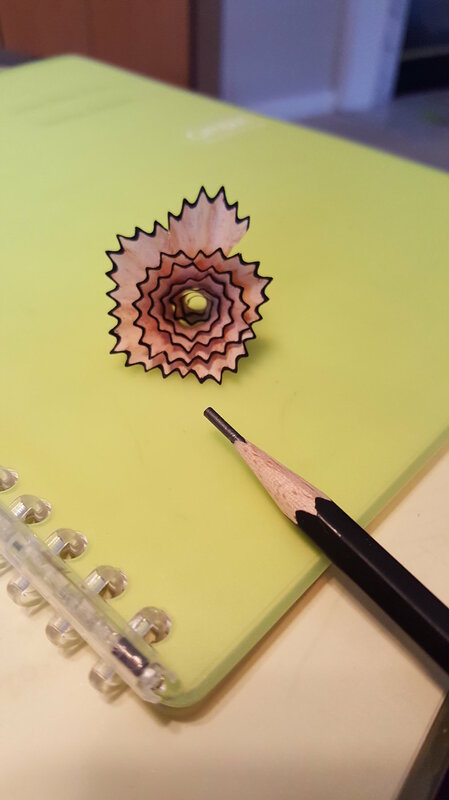 The pencil sharpened up nicely and there was no point breakage at any point during the process. For this pencil, I used the Tombow Ippo Pinch-Point pencil sharpener. Musgrave Pencil Company is located in Shelbyville, TN and has been manufacturing pencils since 1916. While they have a plethora of school-grade pencils, Musgrave is known today as the place to go for custom pencils. With hundreds of options for a billion (ok, I'm exaggerating) occasions, I am sure at some point you have held a Musgrave made pencil in your hand. This week I chose the Musgrave Harvest #2 I purchased in one of my many hauls from CW Pencil Enterprise. It is a simple-looking school pencil with gold foil stamping and a gold ferrule with a maroon colored stripe. The Harvest sharpened up nicely and the shavings had a nice smell to them. Point retention was average, but it was definitely frustrating to have to sharpen so often this past week. The darkness of the graphite was a bit too light for me, but it did not smear and had no discernible grit while writing. The eraser, on the other hand, was horrible. Not only did it barely do its job, it seemed to slough off like a skin-like material (see below). Not sure what's up with that, but don't use the eraser if you don't have to. Writing with the Harvest was not uncomfortable, but I did cramp up a bit due to the perceived lightness to the way the graphite laid down on paper. By Friday, I was down to a nub and was worried I wouldn't make it through the rest of the day, but the Harvest pulled through. The Matte Black Calepino No. 2 pencil is a real gem. Made in France, the Calepino (which comes from the French word calepin meaning notebook) is simple, yet elegant. The pencil has a classic look and "Fabriqué en France" is stamped in a simple script on the barrel. The ferrule is a lustrous gold and it encases a white eraser. The Calepino pencil is made of Pulay wood and sharpens beautifully. Writing with the Calepino was a pleasure as it laid down nice, smooth lines and did not smudge. It's graphite was strong and was not subject to any breakage this past week. The eraser that comes on the pencil is effective, but wears away pretty quickly so have a separate eraser on hand for bigger mistakes. At around two dollars a pencil, these do not come cheap to the everyday pencil user, but well worth every penny. What is interesting to note is that Calepino is primarily a notebook manufacturer, but they hit it out of the park with their pencil design and function here.